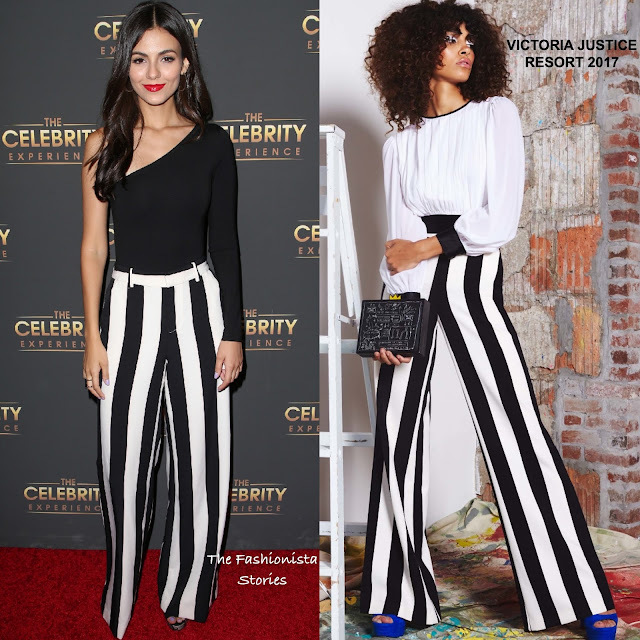 Yesterday(July 16th) Victoria Justice hit the red carpet at the 2017 'The Celebrity Experience' Interactive Event at the Hilton Los Angeles in Universal City, CA. For the occasion, she wore a LPA THE LABEL black one long sleeve top and the ALICE + OLIVIA RESORT 2017 'Paulette' monochrome black & white stripe pants. To give her look a touch of color, a red lip was added top her beauty look. Center part tresses, hoop earrings and black sandals topped off her great look. You can get Victoria's A+O pants via the designer's website HERE and at NEIMAN MARCUS & at SAKS FIFTH AVENUE.